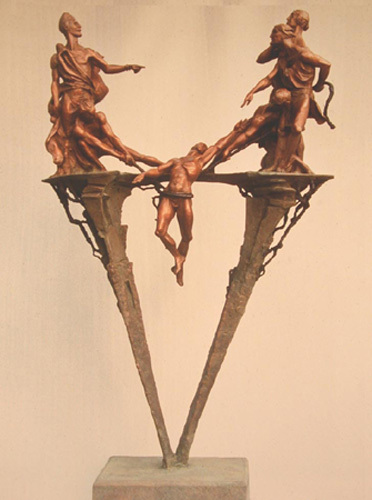 Bronze, 38.5" x 22.5" x 8.25"
This shows Joseph, crying out to his brothers for help, as he struggles to escape the ditch in which he is imprisoned. Due to the favorable treatment Joseph has received from their father, they stand by, unwilling to rescue him. They sell him into slavery and report to their father that he was killed. Many years later Joseph, now in a position of great power, is given the opportunity to take his revenge for their mistreatment, but shows mercy to his brothers instead.